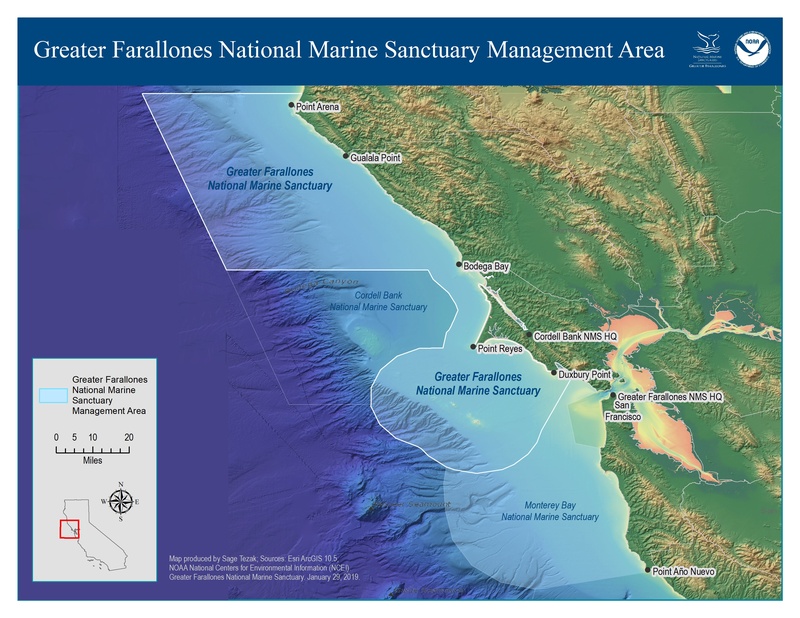 An atlas of Greater Farallones National Marine Sanctuary, featuring bathymetric and topographic information. Note: this map is intended to be printed as a 16.66 x 25 inch poster. This map is provided for your personal and educational use. Three contiguous national marine sanctuaries off the central California coast. Color map of the sanctuary showing color-tinted hillshade and bathymetric features. This base layer is provided by NOAA National Centers for Environmental Information (NCEI). 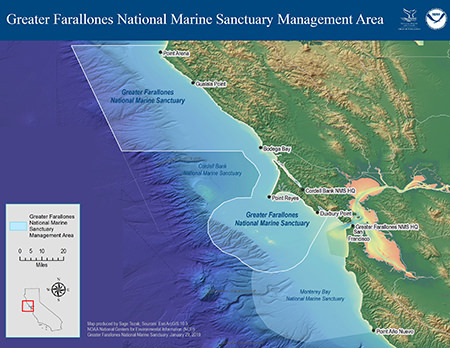 GFNMS also manages the northern area of the Monterey Bay National Marine Sanctuary (MBNMS) from the Santa Cruz-San Mateo County line (in Año Nuevo Bay) to the MBNMS northern boundary, off the coast of southern Marin County and accepts permit applications for this region. Read more about permit applications. Beach Watch is a long-term, volunteer citizen science monitoring program that helps protect and understand our coastal resources. This map shows actively surveyed beach segments. Learn more about the Beach Watch Program. The Rocky Intertidal Monitoring Program is an in-depth education and citizen science monitoring program for high school students, educators, and volunteer groups. Our participants are trained to survey key invertebrate and algal species at established monitoring sites along the coast of California. Learn how to get involved with this program. The Sandy Beach Monitoring Program is an in-depth education and monitoring program for middle and high school students, educators, and volunteer groups. Participants are trained to survey the distribution and abundance of the Pacific mole crab (Emerita analoga) at monitoring sites along the coast of California. Learn how to get involved with this program.